The San Antonio Spurs are "fully engaged" in trade talks for All-Star small forward Kawhi Leonard, namely with the Los Angeles Lakers and Boston Celtics, according to ESPN's Adrian Wojnarowski. The Lakers apparently have the higher urgency to get a deal done for Leonard soon while the Celtics are being "extremely cautious" given Leonard's injury history and his possible desire to sign with the Lakers when he becomes a free agent next summer. Wojnarowski reported last week that the 26-year-old has a strong desire to play for the Lakers as he's a native of Los Angeles. 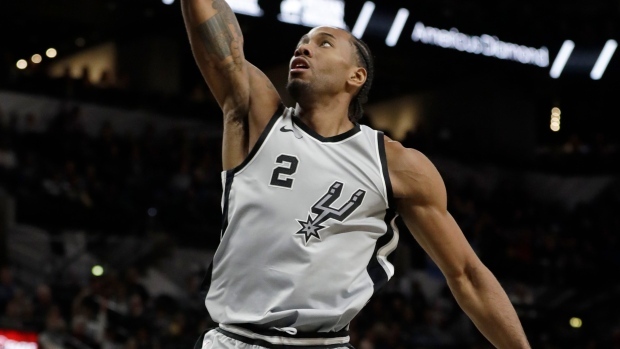 ESPN reported that Leonard is angry over what he believes was a mishandling of a quadriceps injury, as well as comments made by head coach Gregg Popovich and teammate Tony Parker regarding his injury as Leonard sat out. Leonard played in only nine games this season, scoring 16.2 points a night, well below his average of 25.5 in 2016-17. Leonard is eligible to sign a five-year, $219 million super max contract with the Spurs this summer. The Spurs finished last season at 47-35, their lowest regular-season win total since 1999.